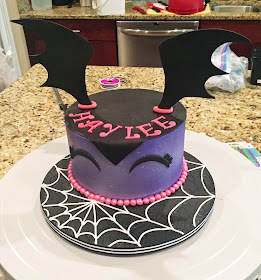 When a friend asked me to make a Vampirina Cake for her daughter's 4th birthday I said, "Vamp-a-who???" Apparently I haven't been keeping up with the latest TV cartoon characters because I had no clue who Little Miss Vampirina was. Anyway the cake my friend select was pretty easy to make, but the one thing that gave me pause was the request for NO FONDANT. Wait WHAT??? Sure I've made buttercream covered cakes before, but they all had a rustic look. I never tried making a buttercream cake with a smooth surface and sharp edges. 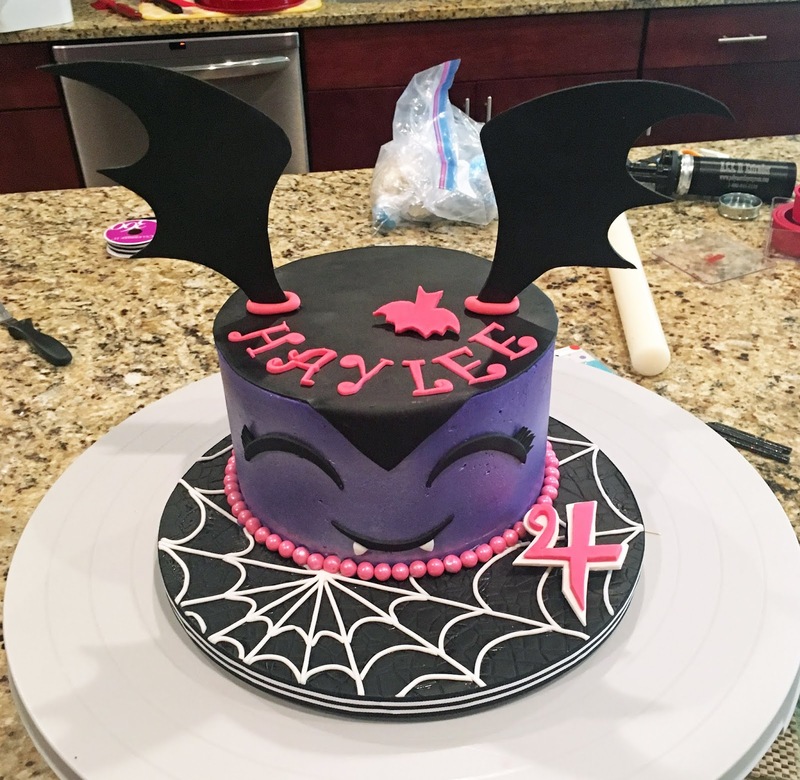 But before I had to deal with icing the cake I concentrated on making Vampirina's bat shaped pigtails. I used black Dream fondant mixed with Tylose power to form black gumpaste, and embedded a wooden skewer into the pigtail cutouts so I could attach them to the cake. 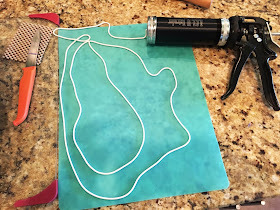 I made the pigtails a few days ahead of time so they would be nice and stiff by the time I needed them. Next I moved onto the cake board. 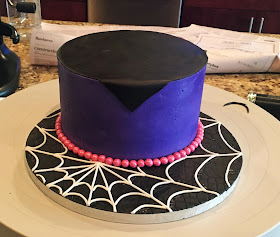 Since Vampirina has a web design on her clothing, I decided to make a web on the cake drum. 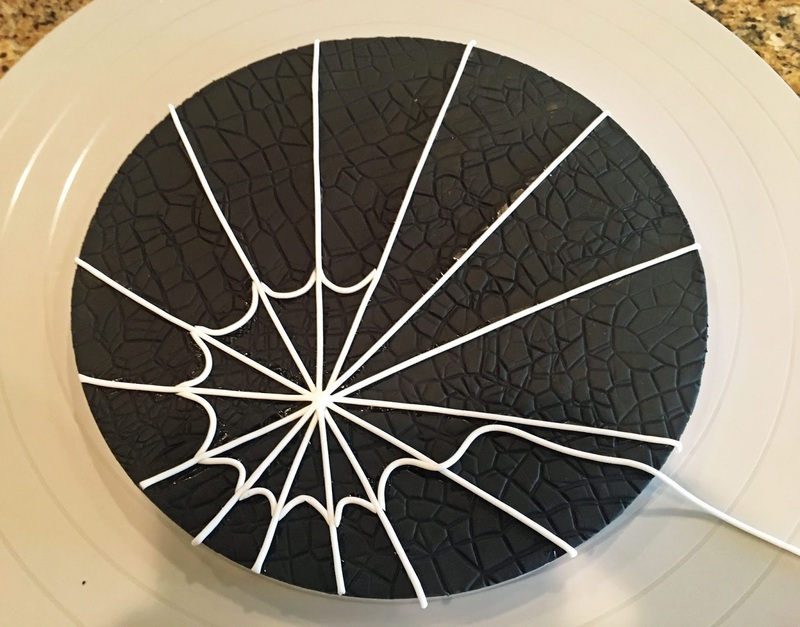 I started with a 14" cake drum that I covered in black Dream fondant. I also use my alligator skin impression mat to give it a little texture, but in hindsight I probably should have left it un-textured (it was a little busy looking). After covering the drum I moved onto the "web". I used my nifty ACE Extruder to make thin strands of white fondant, and then I started to form the web. First I placed two perpendicular strands across the drum. I deliberately positioned the center of the web on the side of the drum because I thought it would make it more interesting looking. After the first two lines where down, I filled in the other lines like I was cutting a pizza. The I just started filling in the arching pieces of the web. I cut each little piece to fit its individual space so it was a time consuming process. 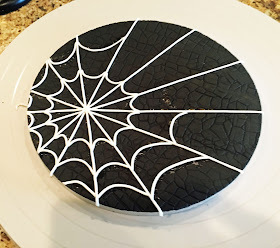 I used vodka to "glue" the white strands to the black fondant below, but I had some trouble with look. The vodka should have evaporated without leaving a trace, but for some reason the sections of the fondant dampened with vodka stayed shiny. Don't know why this happened. After the drum was webified I went to work on the actual cake. 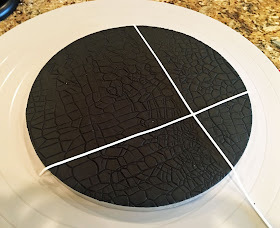 I crumb coated the cake and used my acrylic disks to get those perfectly smooth sides and sharp edges. This method works great (see an example of the process here), but I unwisely used my 8-1/4" rounds instead of the 8-1/2" rounds. 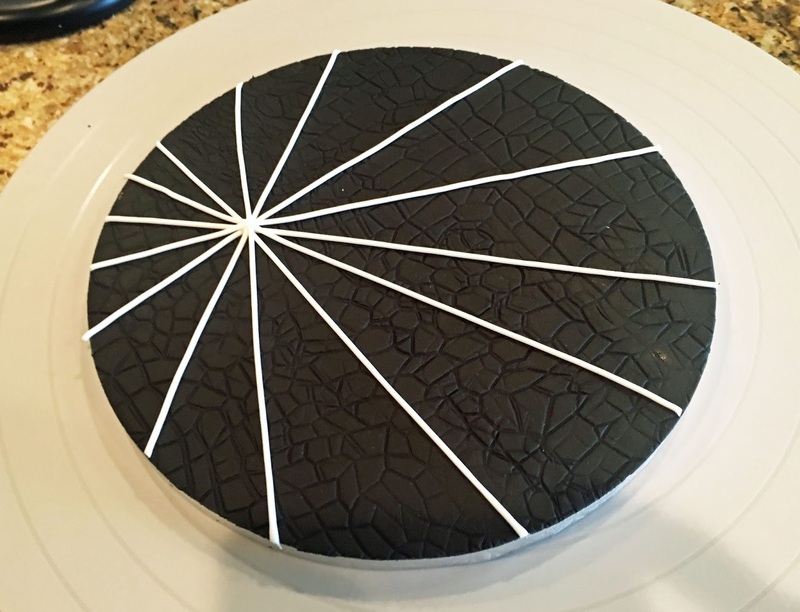 The 8-1/4" round didn't give me enough depth to completely cover the underlying cake with a thick coating of violet buttercream. I actually had places where the cake was poking through the icing! (It almost looked like a naked cake.) 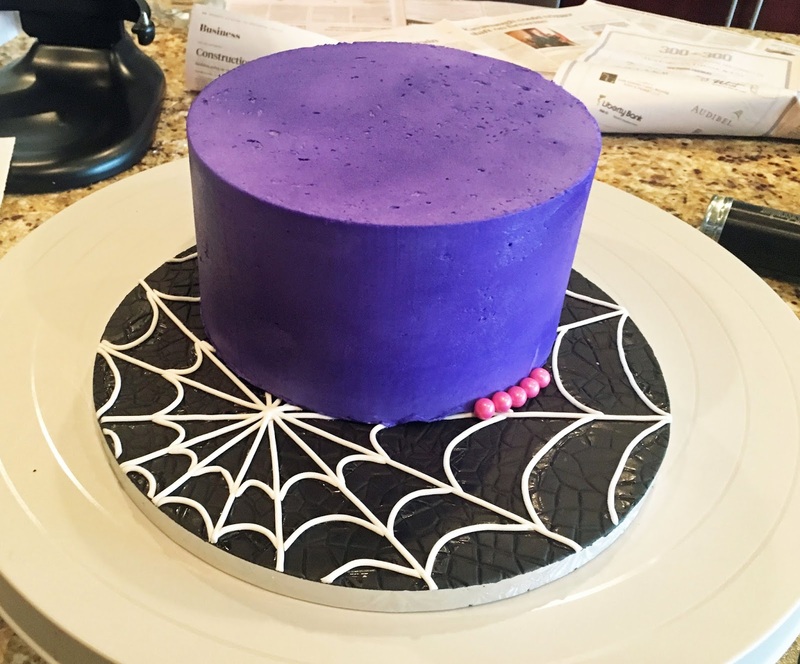 I should have switched out the acrylic disks and re-iced the cake, but I was lazy and just sprayed the cake with some Wilton's Violet Color Mist to hide the boo-boos. 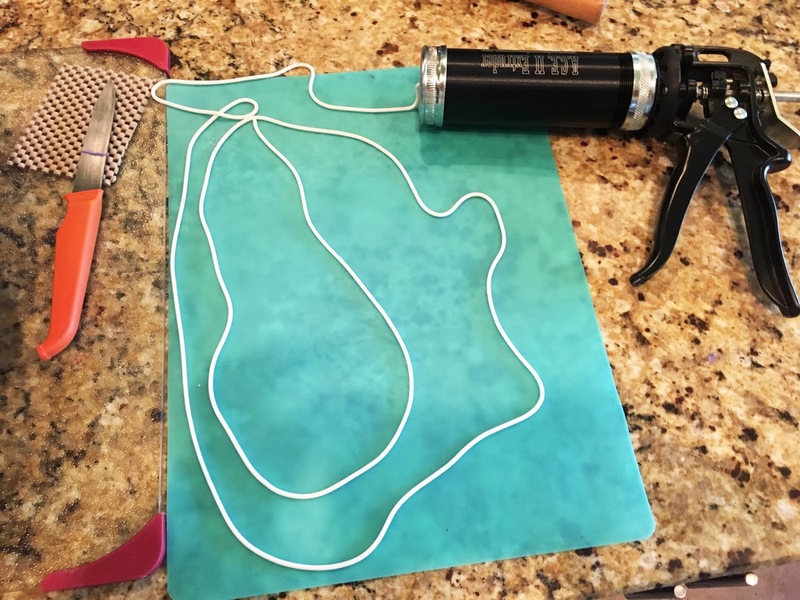 This hack worked like a charm. The violet colored spray hide all the cake that was peeping through the violet buttercream and no one was the wiser. I place the cake on my webby drum, and then used some hot pink Sixlet Chocolate Candies to form the boarder around the cake. Next I placed a thin circle of black fondant on top of the cake to form Vampirina's "hair". At this point I noticed a BIG problem. 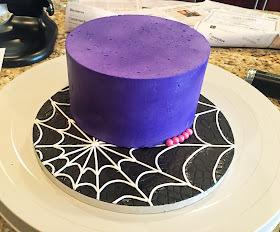 The combination of the violet buttercream and the violet color mist had made the cake surface too dark. When I placed the black "eyes" on the cake I could hardly see them. The black eye just faded into the dark purple background. Not good, not good at all. But the Color Mist saved the day again. This time I used Pearl Color Mist and sprayed it on the front of the cake where the eyes needed to go. The Pearl mist lightened the area and also made it shimmer. That Color Mist (or an airbrush machine) is a life saver. 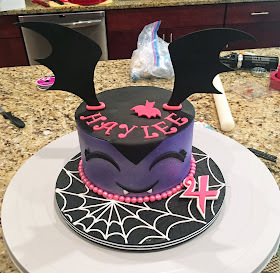 Next the pigtails/bat wings went on top of the cake. And then the birthday girl's name using pink colored gumpaste and my FMM Funky Alphabet Cutters. Originally I was going to place the cutout letters on the cake drum, but it looked too busy so I just put the name on top. At this point the cake was technically "finished", but I thought it looked a little plain. It looked like something was missing. I decided to add a mouth with the tiny little fangs poking out. 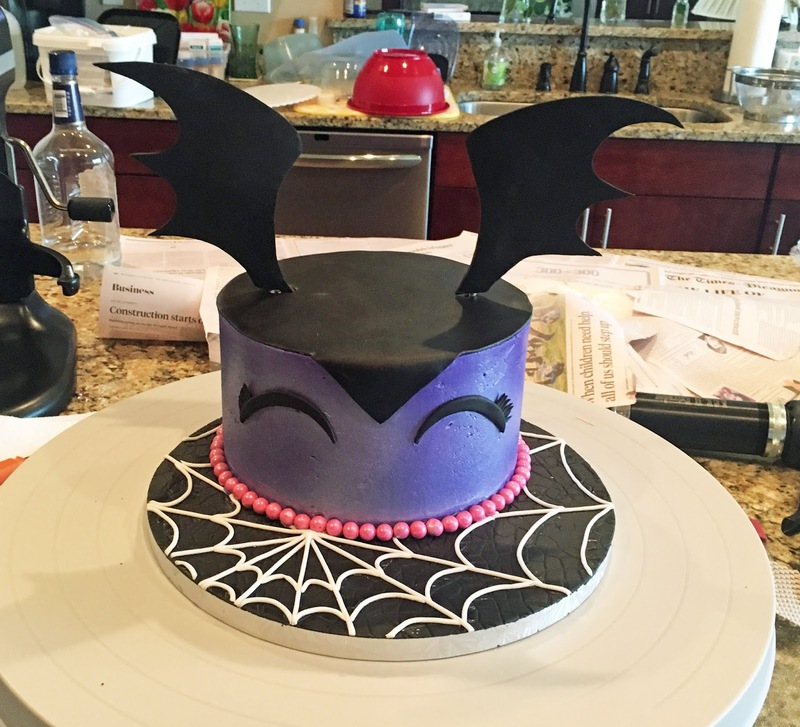 It looked good, but still missing something, so I cutout a tiny bat for the top and the number "4" to place on the cake drum. I was happy with it at that point so I decided it was "finished". Happy Birthday, Haylee. 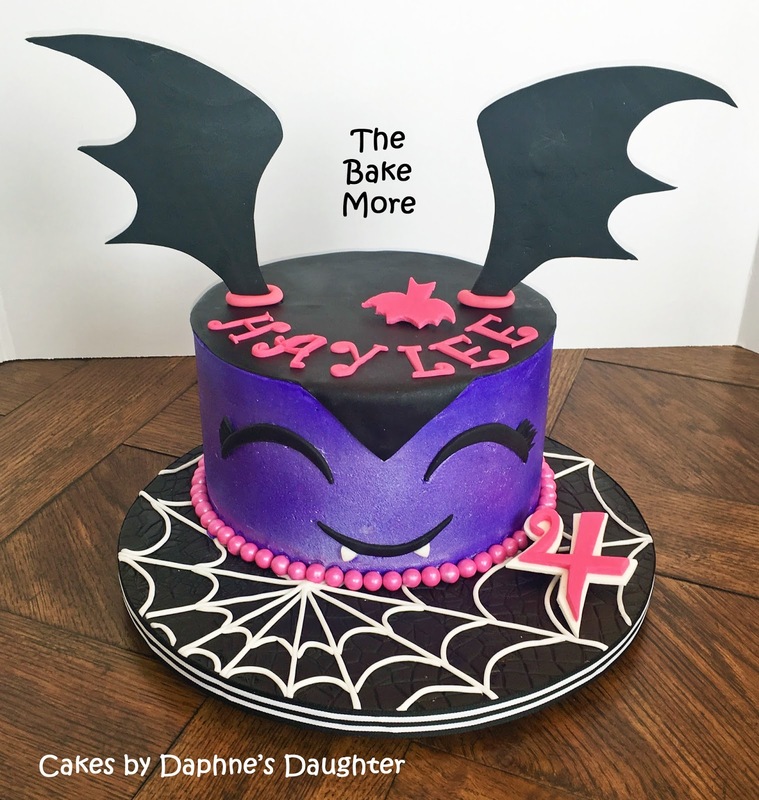 Hope you like your Vampirina. Thanks for this! I was able to make a cake for someone like this due to your amazing walk-through. Do you have an Instagram so I can tag/credit you for the help? 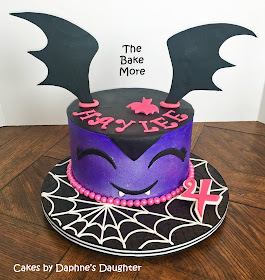 How do you get the bat wings to balance? Mine want to drop to one side and fall off! I used a really long wooden skewer and put about 4” into the gum paste wing. I let the wing harden while still on the skewer. When I was ready to attach the wings to the cake I gently pulled the gum paste wing off the skewer and then hammered the skewer through the cake and into the cake drum below. Once the skewer was in place I trimmed it to an appropriate size and then slid the wing back on the exposed top of the skewer. Hope this makes sense.